Irish War Cry was much the best in winning the Wood Memorial at Aqueduct. Photo by Chelsea Durand/NYRA. Isabelle de Tomaso’s Irish War Cry, the epitome of a “house horse,” will break from the rail as the favorite in Sunday’s 50th running of the $1 million betfair.com Haskell Invitational at Monmouth Park. An ultra-competitive field of seven was drawn for the mile and an eighth Grade 1 fixture here Thursday, including Battle of Midway, a strong third in the Kentucky Derby, and Timeline, who is unbeaten in four lifetime starts. The Haskell will be run as the 12th event on a 14-race card, with post time set at 5:47 p.m. The race will be televised live on the NBC Network. But it is Irish War Cry, who ran second in the Belmont Stakes last out, who carries the weight of 5-2 favoritism and the burden of trying to become the second New Jersey-bred Haskell winner in half a century, and the first since Thanks to Tony in 1980. The “house horse” tag comes from the fact that he is owned by Mrs. de Tomaso, who is a daughter of the late Amory L. Haskell, for whom the race is named. Mrs. De Tomaso and her sister, Hope Haskell Jones, present the trophy for the race to the winning owner every year. Presenting it to themselves would be a first. “Yeah, no pressure, right?” trainer Graham Motion said after the draw, and you could hear the smile come across the phone lines. The Haskell field from the rail out looks like this: Irish War Cry, Post 1, Rajiv Maragh; Don Alberto and WinStar Farm’s Battle of Midway, Post 2, Flavien Prat; Woodford Racing’s Timeline, Post 3, Javier Castellano; Klaravich Stables and William H. Lawrence’s Practical Joke, Post 4, Joel Rosario; Whitham Thoroughbreds’ McCracken, Post 5, Brian Hernandez Jr.; Calumet Farm’s Hence, Post 6, Paco Lopez; and, Brad Grady’s Girvin, Post 7, Robby Albarado. 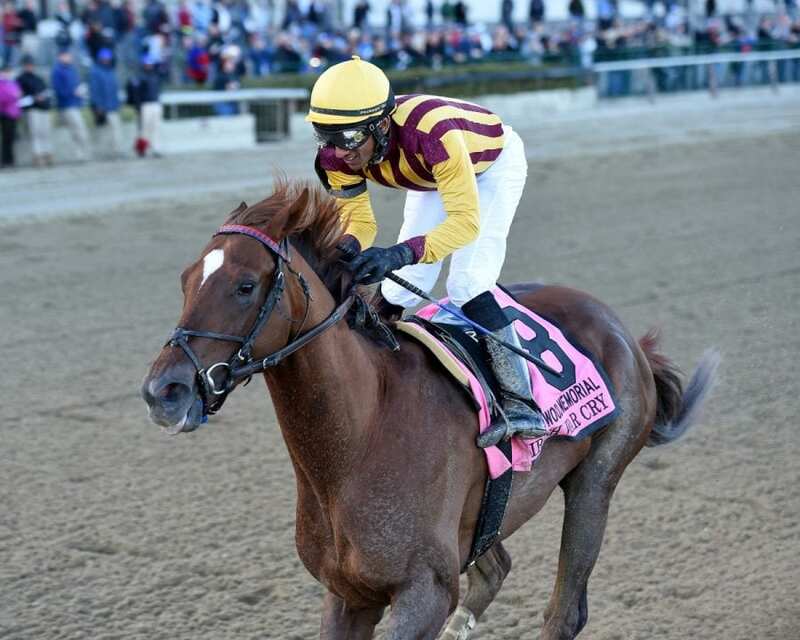 Irish War Cry, a son of Curlin, became a big player on the Triple Crown trail with his daylight victory in the Wood Memorial in April. In the Kentucky Derby, however, the colt was involved in a multi-horse melee leaving the gate, showed speed for a mile and then retreated to finish 10th. Motion elected to skip the Preakness and pointed for the Belmont. Irish War Cry led for most of the mile and a half, but was passed by Tapwrit in the final 50 yards. Second choice at 3-1 is Timeline, one of two Haskell entrants trained by Chad Brown. The son of Hard Spun ran his way into the Haskell with a brilliant score in the Grade 3 Pegasus Stakes at Monmouth on June 18. It was his fourth victory in four lifetime starts. “I’ve had my eye on the Haskell for him a long time,” Brown said. “He’s had a race over the track now, and I think a mile and an eighth will be his best trip. Practical Joke, third choice at 4-1, has won four of his eight lifetime starts, but has never been successful around two turns. He finished fifth in the Kentucky Derby after running second in the Blue Grass Stakes at nine furlongs. Jerry Hollendorfer, who won the 1989 running of the Haskell with King Glorious, sends out the intriguing Battle of Midway on Sunday. The Smart Strike colt ran a huge race in the Derby and finished third at 40-1 behind Always Dreaming and Lookin at Lee. He warmed up for the Haskell by running away with the Grade 3 Affirmed Stakes on June 24. Girvin, who was caught in the final stride by Irap in the Ohio Derby last out, has been working strongly for the Haskell. Sharp said that the colt’s quarter-crack problems seem all behind him. “He’s a healthy horse,” the trainer said. McCracken, who ran third in the Blue Grass as the favorite, was another caught in the Derby melee and he went on to finish eighth as one of the favorites. The Ghostzapper colt, who has been near the top of the 3-year-old champion chatter, got back on track last out when he won the Matt Winn Stakes at Churchill Downs by two and a half lengths. Hence, trained by Steve Asmussen, comes in to the Haskell off a victory in the Iowa Derby. He won the Sunland Park Derby in March, but then ran 11th in the Kentucky Derby.